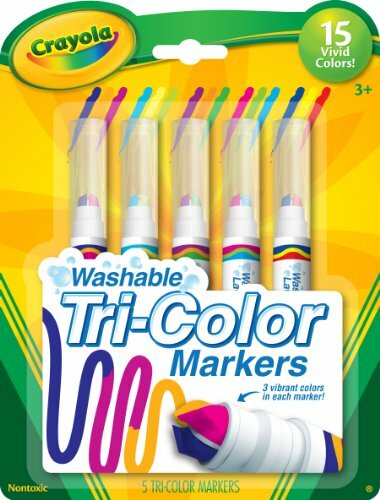 TRIPLE COLOR: Crayola Washable Tri-Color Markers provide kids with a unique way to create colorful new effects. Kids can achieve tri-color effects simply by rotating the marker as they color! 3 COLORS IN 1: Crayola Tri-Color Markers have a segmented tip with three colors in each marker! Create with each color separately or use all three colors at once! Includes 5 Washable Tri-Color Markers! Rotate the tip for immediate color differentiation.